UNITY youth leader leads team to NABI championship – UNITY, Inc. The 2018 Native American Basketball Invitational kicked off on July 8, 2018 in Maricopa, Arizona. 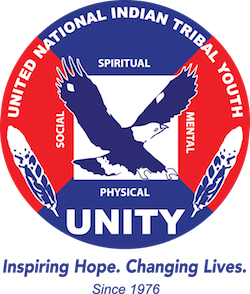 The annual national tournament brings young athletes from across the United States and New Zealand to the desert for the largest rumble of “Rez ball.” Joining the action this year was UNITY youth leader, Coach Santana “Sonny” Johnson of Team Indigenous, hailing from Shawnee, Oklahoma. The Native American Basketball Invitational, also known as “NABI” features some of Indian Country’s brightest and promising athletes. Just a few hours before the NABI team registration, Coach Sonny Johnson was participating in the 2018 National UNITY Conference in San Diego, California. Where he also competed in the annual UNITY 3 on 3 Basketball Tournament, coming in fourth place with his team, “2 Peat.” Like many athletes in attendance for the 2018 National UNITY Conference, Sonny left the conference early for the drive to Maricopa, Arizona for team registration. The tournament came to an end with Team Indigenous besting Otoe Ascend of Red Rock, Oklahoma in the Division II Championship at the Talking Stick Resort Arena in Phoenix, Arizona. UNITY wishes Coach Sonny Johnson the best as he continues to shape and inspire the lives of Native youth in Oklahoma.